Birthday Cake Report: Liz made an awesome birthday cake for me this week from what else - my favorite new cookbook - DECEPTIVELY DELICIOUS! It was a box cake made with egg whites and pumpkin puree. The pumpkin makes the cake rich and moist, deeply chocolaty and it tastes nearly as good as one made from scratch. There are complete home-made recipes for cakes using ingredients such as roasted beets or pureed spinach, but this cake was easier and chocolate - two big pluses in my cookbook! 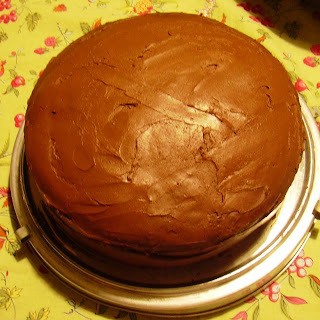 The frosting was made with low-fat and non-fat cream cheeses, cocoa powder, vanilla extract, powdered sugar and a few tablespoons of non-fat milk. The frosting has a buttery tang to it but isn't at all overly sweet or cloying. We think the points value of the cake goes down from 12 points per serving for the box recipe version to 5 points per serving for the lightened version. Would we make this cake again? Most definitely. It made me realize that there are many ways to lighten a cake and still enjoy it. Can you have your cake and eat it too? You betcha!